Here at Lucidchart, innovation in everything is a motto we live by. So we're always identifying areas to improve so our software is the most efficient and useful to our users as it can possibly be. While we're confident that these features will help most of our users, we want to know what features you want to see. So let us know in our forums - we're listening. Read on for details about some of our included features - quick shape replacement, easy step insertion and spell check! When the shape changes, all of the text, connected lines and other properties will be preserved. This currently works for flowchart and BPMN shapes. Ever forgotten a step in your chart? 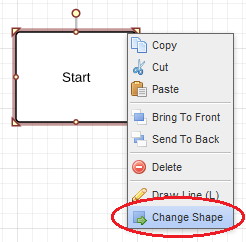 Before today, you had to disconnect the lines, drag the new shape on the canvas and reconnect the lines to insert it into your flow. Now, when you drag a new shape from the toolbox onto the existing line, it will show you the potential connection points. When you release, it will automatically insert that shape into the flow (see below). When you are typing and misspell a word in Lucidchart, it will now be underlined in red. If you right-click on the word, the dictionary will offer suggestions that you can choose from. 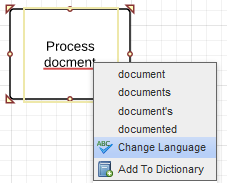 If you are editing a document in another language, you can choose from one of 60+ languages for the spell check by right-clicking on a word and selecting “Change Language.” You can also choose “No spell checking” to turn it off completely. Finally, if you want to see all the spelling errors on your document, click the Spell Check icon in the properties bar (see right) to underline all misspelled words. We hope you enjoy these new features. As always, we look forward to hearing from you if you have any questions, feature suggestions or feedback!